For a great many years, ever since first grade, I've been plagued with anxiety attacks. I vividly remember the first time I had one. I was watching a movie with my mom, and I began to hyperventilate. It was triggered by something in the movie, though what I was watching had nothing to do with my present circumstances. I asked my mom what was happening, she explained to me that it was an anxiety attack and I was hyperventilating. I got over it, though it took awhile, but it was great to have my mom to help me through it and to remain calm while explaining it. She didn't tell me to stop worrying, she didn't tell me I was wrong for having these feelings, she just sat with me and talked me through it. The next day at recess, I was running up the hill and couldn't catch my breath. My teacher said, "Hurry up, Stephanie" and, at six years old, said, "I can't... I'm hyperventilating. Just give me a minute." For those of you that have been lucky enough never to have had an anxiety attack, let me try to explain it to you. Let's say, for instance, you're afraid of spiders. An anxiety attack, then, is akin to being tied down to a bed and having a tarantula walk across your face. Or, if you're afraid of heights, standing on the very edge of the Grand Canyon with nothing holding you back from falling off the edge except your own agility or lack thereof. The problem with an anxiety attack is that it cannot be pinpointed. There is no precise fear. No "this is happening, so that is why I am scared to death" thing to attribute it to. It's a sense of impending doom that may or may not be attached to anything else that's going on in your life. For me, when it occurs, I can usually handle it because it's been happening for so long I've learned to recognize and thwart it before it gets out of hand. I have to accept it for what it is... something small and innocuous threatening to be a big scary monster. 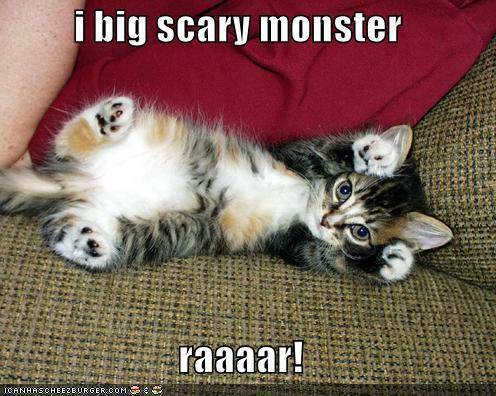 It's only a big scary monster if I let it be. First, my stomach falls. You know the feeling when you start to go down a rollercoaster, the initial drop of your stomach before the rush of excitement? That one second of "I AM GOING TO DIE" in your belly? That's how it starts. Then something fixates inside my head and it won't leave. No matter how much I tell myself it isn't real, it's not happening... it won't leave. I have trouble breathing. My brain won't stop churning. My heart beats erratically and my hands get clammy. My mouth gets completely dry and I have to go to the bathroom. I can't catch my breath. I am breathing like mad, but I don't feel like I'm getting any oxygen. I can feel a huge weight in my chest, first pressure and then pain. The corners of my eyes go black -- my peripheral vision, I mean. I feel my temperature rise to where I think I'm going to pass out. And all the while I can appear on the surface like everything is fine -- I can go about my job, I can smile, I can fake conversation, but on the inside, the entire time, I am absolutely positively convinced that something horrendous is going to happen, or, in fact, IS happening, RIGHT NOW. Eventually, it dissipates. Sometimes I need to hear someone's voice. Sometimes I need to just sit and be with someone. Sometimes I need to drink something, or eat something. Sometimes I need to put my headphones on and listen to really loud music. Sometimes I need to watch a movie and get my mind off things. Sometimes I just need to let it get the best of me, and sob my eyes out. And sometimes I need to hear my mom telling me that I'm okay, that I'm normal, that I'm not crazy. It's a comfort to know that I'm not the only person who has ever had these. All the women in my family have them from time to time, some more often than others. Stress, obviously, is a major trigger, but who can eliminate stress from their lives? The best we can do is slow down once in awhile, and, in most cases, just pray. 1 Peter 5:7 says "Cast all your anxieties on Him, for He cares for you." It's also a comfort to know that, even when I can't talk to my mom someday, I can still talk to Him. He'll tell me I'm okay, I'm normal, I'm not crazy. I might not hear His voice on the phone, but it's there if I listen. And, just like that, the big scary monster turns into a little ball of fluff, and I go on with my day.